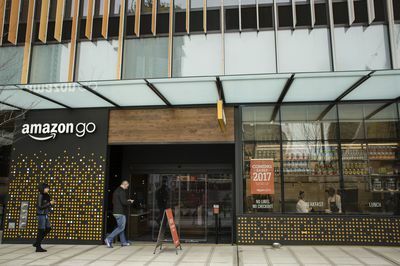 The Amazon Go grocery store in Seattle. The system is working well for individual shoppers but still struggles to accurately charge people who are moving around in groups, such as families with grabby kids, the person says. Go engineers have been studying families shopping together and are tweaking their sensors to recognize when a child eats an item while wandering around the store. Engineers are also figuring out which person to charge when a couple goes shopping together. Amazon has encouraged employees to enter the store in pairs and buy lunch. It’s unclear how quickly Amazon Go will ramp up. The company has moved deliberately with its brick-and-mortar book stores, opening just 13 in seven states since launching the first one in Seattle two years ago. Analysts expect a version of Amazon Go technology to be rolled out eventually at Whole Foods. That’s a far more challenging prospect because Whole Foods locations are much larger than the 1,800-square-foot convenience store and carry thousands more products. Amazon, which says it currently has no such plans, would need a lot more testers wearing Pikachu costumes to pull that off.